Almost every state in the country now allows certain foods to be produced in home kitchens and sold direct to consumers. What you can make, under what conditions, and where you can sell varies widely from state to state. Download this chart for an overview and citations to state laws around the country. This is not legal advice. You should research the laws in your own state and consult an attorney licensed to practice in your state if you have questions. Prior to 2011, it was illegal to sell any food that a person prepared in his or her home. In 2011, the Farm and Ranch Freedom Alliance (FARFA) worked to pass the first Texas Cottage Foods Law, which allows people to sell specific low-risk foods directly to consumers from their homes, up to $50,000 per year. In 2013, FARFA worked to expand the law to include more foods and allow sales at more locations. The new law (HB 970) went into effect on September 1, 2013. Click here to read the text of HB 970, relating to regulation of cottage food products and cottage food production operations. What is required to sell under the cottage foods law? These requirements, along with other issues such as zoning, business considerations, health department jurisdiction, and sampling, are explained in more detail throughout this article. The information contained in this article post is not intended as legal advice. Consult an attorney if you have questions about how this law applies to your situation. The law lists specific foods that can be prepared at home and sold directly to consumers. All of the items listed below are limited by the requirement that they be “nonpotentially hazardous.” The cottage food law covers only nonpotentially hazardous foods. These are foods with a low water activity and low pH level that inhibit the growth of dangerous micro-organisms. Basically, it means non-perishable foods: foods that you would not normally keep in the refrigerator. However, not all shelf-stable foods are nonpotentially hazardous, as shown in the next section (see “Types of Foods That Can NOT Be Sold Under the Cottage Foods Law“). Fruit butters: Only nonpotentially hazardous fruit butters may be made and sold by cottage food producers. These include: apple, apricot, grape, peach, plum, quince, and prune butters. If you would like to make another fruit butter, you should contact Food Safety Net Services and have a sample of your fruit butter tested for pH and water activity to confirm that it is nonpotentially hazardous. Food Safety Net Services is located in San Antonio and can be contacted through its website, www.food-safetynet.com, or by calling 888-525-9788. Fruit butters that are potentially hazardous are not allowed under the cottage food law. The following butters are usually considered potentially hazardous: pumpkin, banana, and pear. These butters require special steps be taken to ensure that they are not contaminated with botulism, and cannot be sold as part of a cottage food operation. Recipes: While many baked goods are clearly nonpotentially hazardous (NPH), sometimes it depends on the precise recipe used, such as cream cheese frostings. Kelley Masters, a home baker and one of the lead activists who helped pass the cottage food law in Texas, has published a book with recipes that she has had tested to determine if they are PH or NPH. Visit www.TexasCottageFoodLaw.com for more information. Pickles: First, only pickled cucumbers are allowed; not all pickled vegetables. Second, there are federal requirements for making acidified foods such as pickles. If you sell across state lines, the federal requirements would definitely apply. Under the FDA’s interpretation of “interstate commerce,” the federal requirements might also apply to cottage food producers who purchase supplies from out-of-state. As a precautionary measure, you may wish to take the federal course if you intend to sell pickles under the cottage foods law. The course is offered once a year at Texas A&M; contact the course instructor, Dr. Al Wagner, at 979-845-7023 for more information. In addition, although pet food is usually nonpotentially hazardous, it is not included in the cottage food law. Animal food is regulated by the Office of the Texas State Chemists, Texas Feed and Fertilizer Control Service. You can contact them at (979) 845-1121 or visit their website at otscweb.tamu.edu for more information. Note that many CSA’s (community supported agriculture farms) meet the definition of “farm stand.” Cottage food producers are encouraged to partner with local CSAs for their mutual benefit. You can find farmers’ markets and CSA’s in your area at www.LocalHarvest.com. A cottage food operator may also deliver products to its customers. A cottage food producer may not sell to a retail outlet (such as a store or restaurant), over the internet, or by mail order. 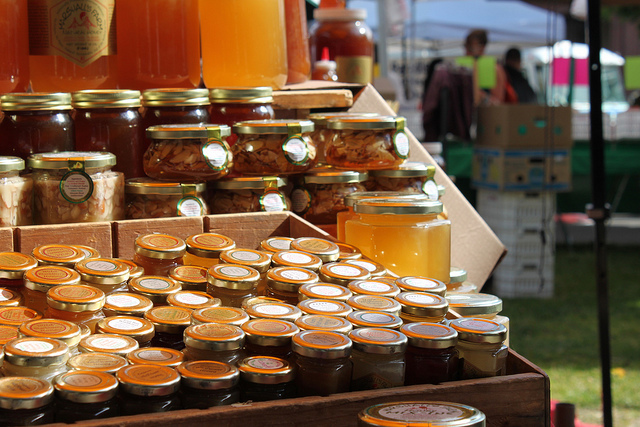 A cottage food producer also may not sell at events such as craft fairs and flea markets, unless sponsored by a nonprofit organization. While internet sales are forbidden, there is no restriction on a cottage food operator’s ability to advertise, including having a website. Similarly, a cottage food operation can take deposits over the internet, so long as the final sale occurs face-to-face at the producer’s home, a farmers’ market, or other allowed location. The label must be legible. The label must be attached to the package. For large or bulky items that are not packaged, you must provide an invoice or receipt that has the same information. A cottage food producer must take and complete an approved food handler’s course. This course is offered by many local agencies and online. The course typically costs $10 to $20 online version; in-person courses usually cost more. A food handler’s card is good for two years, and it must be kept current. A cottage food producer needs only take and pass the course. You do not need to register your food handler’s license with the local health department in order to sell under the cottage foods law. A private company, Ace Food Handler, offers the online food handler’s course for only $5. They have developed, and are continuing to add to, a second course that focuses on issues specific to cottage food producers for an additional $5. The cottage food safety course does not fulfill the statutory requirements – you must have a food handler’s card. But the additional course can be helpful for people to learn safety measures that are relevant to producing foods in a home kitchen. For more information, visit www.acefoodhandler.com. A cottage food production operation may have employees. Anyone who is handling or preparing the food must either have a food handler’s card of his or her own, or be under the producer’s direct supervision. Members of the producer’s household are exempt from the requirement for direct supervision. A cottage food operation does not need to get a license from the state or local health department, or register with the state or local health department. The state and local health departments are directed to keep a record of any complaints that are made about cottage food operations. They do not have authority to investigate such complaints or conduct inspections. The only exception is that the state and local health departments retain jurisdiction to close any business – including a cottage food operation – that poses a serious and immediate threat to human life and health. A cottage food operator is not required to allow the health department to come into your home and do an inspection unless they have a warrant. If the state or local health department claims that you cannot sell home-produced goods, the first step is to print the law and show it to the person you have been communicating with. If that does not resolve the issue, the next step is to contact the City Council or County Commissioners. Be sure to get documentation of all conversations in writing. In extreme cases, you may need to obtain legal representation. FARFA may be able to help in the process. The 2013 cottage foods law specifically prohibits a county or municipality from regulating a cottage food operation, or banning a cottage food operation on the basis of zoning. A cottage food operation does not need to get a zoning permit or business license from the city. Neighboring property owners still have the right to take action for nuisances or other legal claims against the cottage food operation. The law does not address restrictions by private homeowners associations (HOAs). Usually, HOAs are concerned about the outside appearance of the home, and they are not concerned with activities within the home. For example, there are many people who sell Mary Kay or other items from their homes. If your HOA has restrictions on home-based businesses, you may be able to avoid a confrontation by keeping the exterior of your home and yard free of any advertising or other obvious signs of your cottage food operation. The following items are not addressed in the state law, but are often asked about by cottage food producers. Insurance: While you do not have to have liability insurance, it is important to protect your assets. Some farmers markets, events, and wedding venues require proof of liability insurance from all food vendors. There are many companies that offer insurance, and we encourage you to compare options. One company, American National, has an insurance policy specifically designed for cottage food producers. Contact Eileen Coleman, Coleman Agency, at Eileen.Coleman@american-national.com or (512) 250-2168 for more information. Advertising: There is no restriction on your ability to advertise. You can advertise through a website or Facebook, putting business cards or flyers out at local retail outlets (with the retailer’s permission), or any other legal means. Income tax: The cottage food law has no effect on federal income tax law. Normal IRS rules apply; consult a tax professional. Rendition tax: Counties can require a rendition tax on your business assets and equipment. ; application and enforcement varies county to county. Private entities: If you wish to sell at a farmers’ market, farm stand, or nonprofit event, you must get permission from the event organizers. The cottage foods law governs your rights with respect to the government, but not with respect to private entities. The market, farmer, or nonprofit may impose whatever rules or fees they wish. The simplest option for sampling is to package and label sample-size portions in your home. At your sale location, whether it’s a farm stand, farmers’ market booth, or other, you can provide these pre-packaged, pre-labeled samples with no further requirements or regulation. If you wish to prepare the samples on-site (cut the cake, dish out some of the jam, etc), then it may become more complicated. Under HB 1382 (also passed in 2013), any vendor at a farmers’ market should be able to prepare and provide samples on-site as long as they meet some basic sanitation requirements. You can ask your farmers’ market organizer for details, or visit www.farmandranchfreedom.org/category/local-foods/texas-local-foods for our fact sheet on HB 1382. While the intent of the bill was to pre-empt local regulation, not all jurisdictions are respecting that interpretation. Sampling at other events would be subject to the requirements of a temporary food establishment (TFE) permit. Some jurisdictions interpret the TFE requirements to require only food made in commercial kitchens, so it may or may not be allowed. Consult with your local health department if you want to provide samples of your items at a public event other than a farm stand or farmers’ markets. The cottage foods law is intended to allow small businesses making low-risk foods to start up without facing the burdens of extensive health department regulation. If you wish to make foods that are not allowed under the cottage foods law, sell over the internet, or are ready to grow beyond the $50,000 cap, then you need to talk with the health department about the requirements for a commercial kitchen and food processing license. Special thanks go to Representative Eddie Rodriguez and Senator Bob Deuell, the sponsors of HB 970 (the 2013 cottage foods bill), and Representative Lois Kolkhorst and Senator Jane Nelson, the sponsors of SB 81 (the 2011 cottage foods bill). Thanks also go to Kelley Masters of Texas Bakers’ Bill for her tireless work for cottage food producers, as well as to the hundreds of people who attended the committee hearings and FARFA’s lobbying days, or who wrote or called their legislators to help pass these important bills. For more information, email info@farmandranchfredom.org or call 254-697-2661.